I combined free-form pen and ink curves with negative-space lines that I drew with masking fluid. The term ‘negative-space line’ seems oxymoronic, since a line has virtually no width dimension. I define ‘space’ on a two-dimensional surface as a bounded shape. I used the inked lines to form the edges of color fields. The white traces, uncovered after the mask was removed, are long, thin areas that echo some of the sinuous edges that are the borders of the colored areas. I like the interplay of the edges of the colored areas with the white (2-dimensional) lines. The blue spiral and orange curve are two of the negative negative spaces interspersed with the white, ‘negative-space lines’. 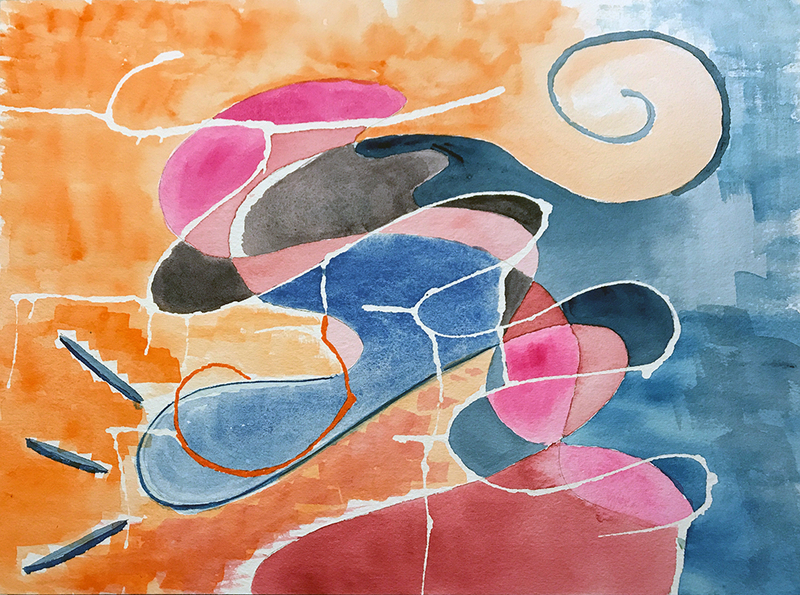 This entry was posted in Personal Stories and tagged abstract art, artistic process, creative process, edges, frisket, negative space, painting, pen and ink, visual arts, watercolor. Bookmark the permalink. Thanks, Dr. V! I hope you love me beaches! To me it looks like a piece of music in painted form. Nice. N.
Thank you for that, Nina!